We’ve all been there. It gets to the end of term, and you start to tidy out your room, and realise quite how much stuff you’ve accumulated over the year. Be it the multitude of unread textbooks that are clearly essential to your course, a mass of free tee-shirts and everything else in-between. We know packing to go home isn’t the most fun activity, but here at the Union we’re going to try and ease the pain as much as we can. 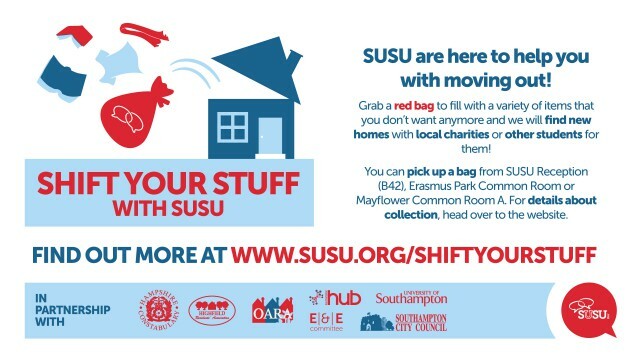 This year we’re running a ‘Shift Your Stuff’ campaign, to help you declutter and shift your unwanted items when you move house this summer. All you need to do is collect a red bag from the Union Highfield Reception, WSA Reception or Erasmus Park Halls before the 29th of June (and if you live in Portswood, Highfield or Erasmus Park you will get one of these bags delivered through your door), fill the bag up with your unwanted items including: clothes, home ware, kitchenware, electronics, books, stationary and non-perishable food. (The only things we don’t accept are sharp knives, liquids or perishable foods!) and drop it off at SUSU Highfield Reception or WSA before the 30th of June.